Sysessential for DBX to MBOX Converter is a software solution that aptly moves emails from Outlook Express DBX files into MBOX file format. This application has provided immense of ease and comfort to Outlook Express users when cannot switch DBX emails into MBOX file format. There is software testing proviso. Users can access the conversion process in freeware demonstration edition. 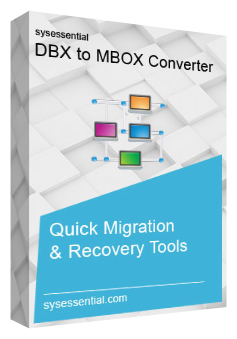 By downloading the application in free demo run, you will be able to acquire all comfort in accessing conversion of first 10 emails from DBX files into MBOX. Sysessential for DBX to MBOX Converter is an efficient tool as user hardly requires putting lots of efforts to run the tool. It works automatically and sequentially exports DBX files into MBOX file format. You will discover that software will keep folder such as Sent Items, Drafts, Deleted Items, Outbox and Personal Folders as it is while migrating emails into MBOX file format. It implies that folder entity remains same even after migration process done. If you are worrying for conversion process and especially about data safety then we assure you that data is absolutely safe as tool uses latest and simplified conversion methods. It performs trouble-free conversion and moves data safely into MBOX file. For user ease, data is saved into separate file. This is a convenient feature that let user’s access data easily. They can use the data with ease whenever they feel the requirement and work with those files again. It is highly competent tool to operate as it firstly scans EDB files and them move into MBOX file. User can select the emails prior conversion or can also move complete data into MBOX file format. How free demo edition is different from fully operable edition? Free demonstration edition is free testing of the tool to acknowledge the functionalities of the tool. Download this edition and check out important working process and features in detail. The demo will show the export of first 10 emails into MBOX file format. If things are clear to you then place the order for software. List the Outlook Express editions software supportive of? Which OS supportive of the tool? Will software able to keep folder structure and metadata into unchanged? Software preserves folder structure and does not bring any change in the order of folders. You will access same folder hierarchy as in DBX files. In the same manner, software confirms about metadata into safety. The metadata properties such as To, Cc, Bcc, unread/read status etc will remain unaltered even after conversion of emails. Is there any time saving option with the tool? In order to save time, software performs batch data migration. This leads to export of unlimited emails in one go. Will tool export email attachments as well? Yes, this application is supporting of exporting emails in the exact way available in DBX file format. No changes ever experienced to the emails as well as email attachments. How about the purchase function with the software? The application is useful to purchase in the long run. It supports for migrating DBC emails completely into MBOX file format. If you wanted to purchase the tool then call at the helpdesk and seek the immediate response from support team. They will let you know entirely about easy purchase techniques and procedure. After deciding for moving to Evolution, we failed to decide which way to choose for converting Outlook Express DBX files into MBOX file format. Due to so many solutions available, I was little bit confused. So though of an idea to test the tool in free demo run. I work on many software tools and finalized for Sysessential for DBX to MBOX software tool. This application is so comfortable to use. Also, it is safe and hassle-free to perform email conversion from DBX to MBOX file format.